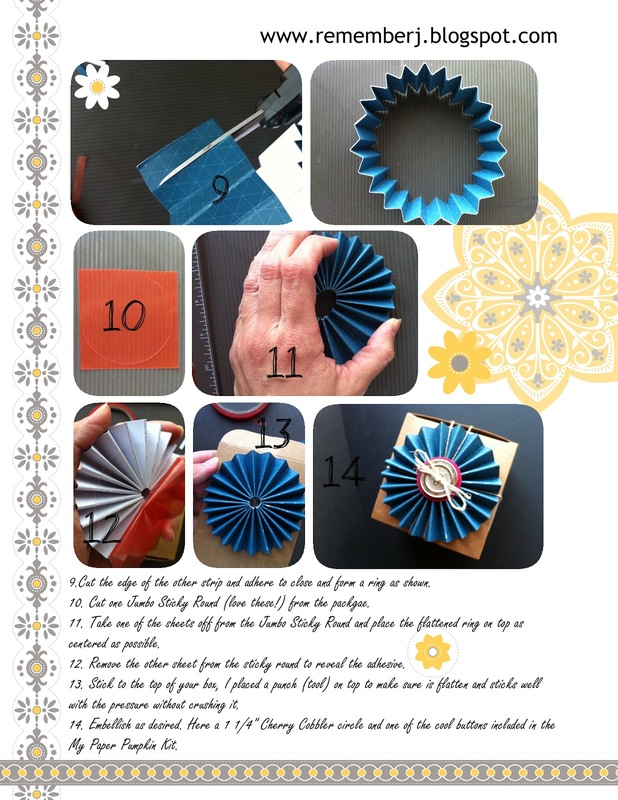 Stamp a Blessing: Fun Rosette Tutorial for you! Seriously! 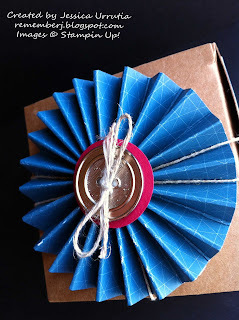 Today I finished my cute tutorial in how to make the rosette I used for my box. Ayer les mostre un proyectito lindo con el kit de My Paper Pumpkin Seriously (seriamente)! 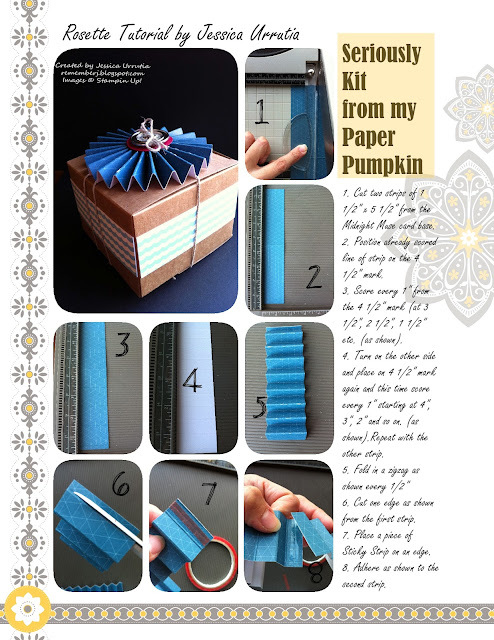 Hoy les termine un divertido tutorial en como hacer la 'rosette' que use para decorar mi cajita. 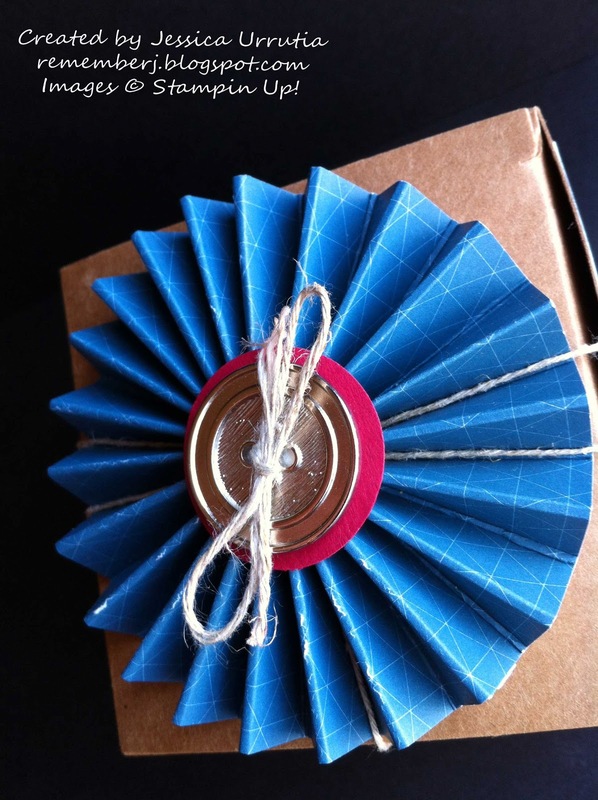 One quick tip when you make your rosettes is measure the top of your box and figure what size rosette you want to cover it with. If your rosette needs to be 3" (as the one we made here) then cut your strips of paper half that size; in this case 1 1/2". Nice and easy for any size you need! Un pequeno tip en el tamano de los rosettes es medir el tope de la cajita donde la quieres poner y decifrar de que tamano la necesitas. Si quieres un rosette de 3"(como la que hice aqui) entonces cortas tus pedacitos de papel a la mitad de ese tamano. Por ejemplo a 1 1/2". Chevere y sencillo! To see BIGGER click on the images. To see and print the PDF document click HERE! Para ver e imprimir el documento en PDF oprima AQUI! Leave me your love with your comments and Creative Blessings! Dejeme sus carino con sus comentarios y Bendiciones Creativas!